Are you fan of French macarons? I'm not talking about the heavy coconut-lump macaroons; I'm talking about the light sandwich pastry with a filling in between, the upscale Oreo, the delicate, sweet hamburger (OK, that's a bit of a stretch). But if you've had a French macaroon and wanted to know how to make them yourself, here's how to do it. Despite it having the reputation of being a tough thing to make, we've found the technique to use that really never fails. Just follow these directions carefully! You won't be disappointed. 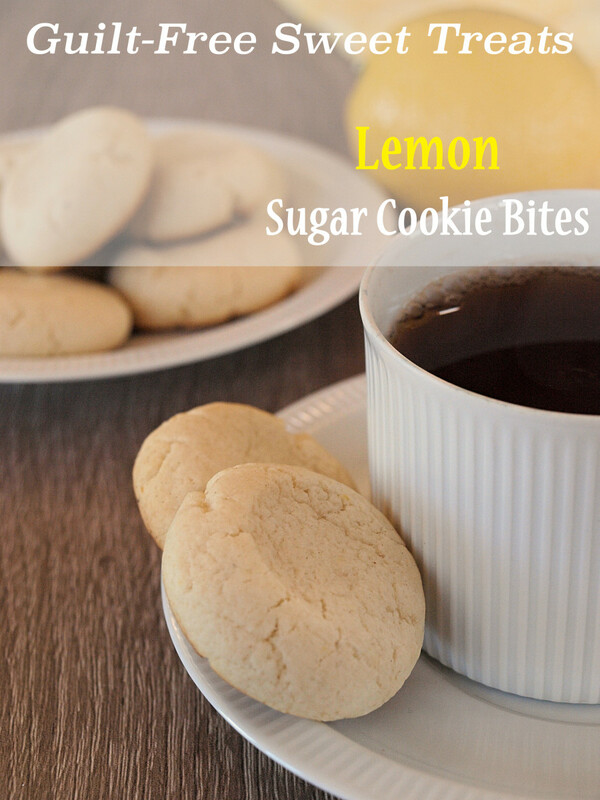 This really is the simplest, easiest way of making these delectable little treats. 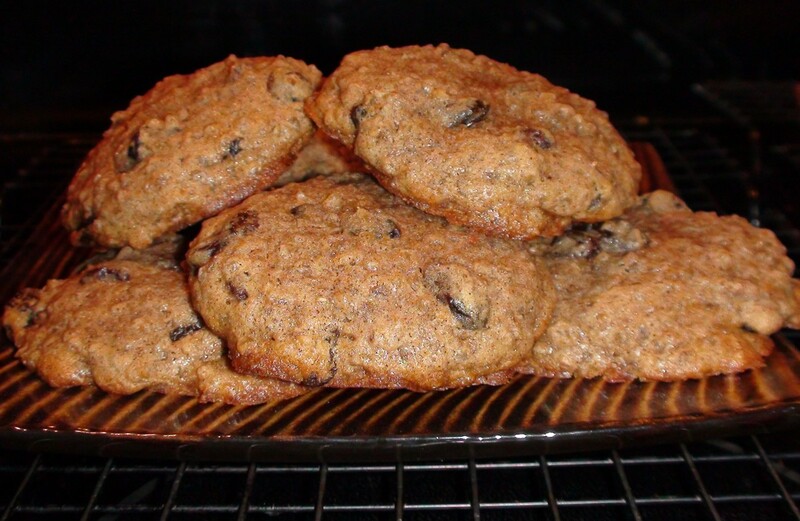 Gluten-Free: This recipe is gluten-free, so it's safe for those who must avoid gluten. Grain-Free & Kosher :There is no grain (provided your powdered sugar doesn't have corn starch), so these are kosher for Passover. Low-Calorie(ish): Depending on the size and filling, macarons have between 45 and 150 calories apiece. When it comes to pastries, fairly precise measurements are important. 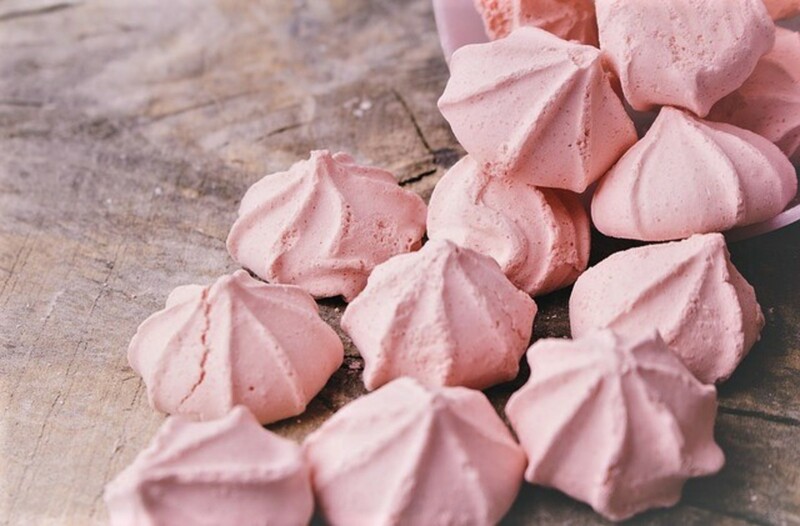 This recipe uses a technique (the Italian meringue, or au sucre cuit, method) that is a more failsafe method than the traditional French whipped-egg-whites technique, but it's still possible to mess up. If you don't have a kitchen scale, then try using my volume/number based approximations, but if you do, then stick to those approximate values throughout. I do not recommend using silpats; due to the thicker silicone, the bottoms never cook through completely, and your macarons will stick. Step One: Put Egg Whites in Your Mixer and Preheat Your Oven. Put one of your 75g egg-white portions in your mixer to allow it to warm up to room temperature. 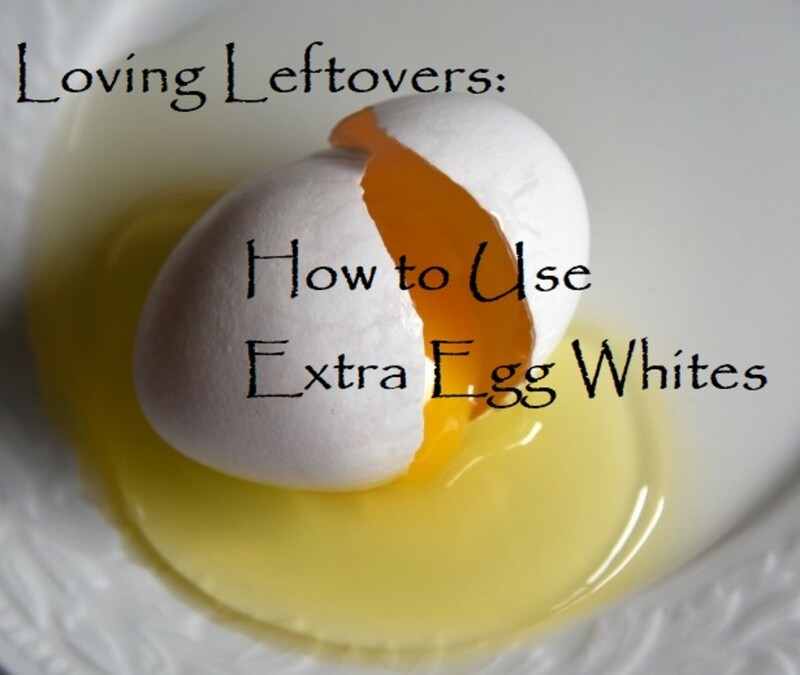 If your egg whites are already at room temperature, then you can skip this step (or, rather, just do it later). If it takes some time for your oven to heat up, you might as well start preheating now: you'll want to set the temperature to 320F (or 160C). Step Two: Blend Almond Meal and Powdered Sugar. Put your 200g of almond meal and 200g of powdered sugar in a food processor. 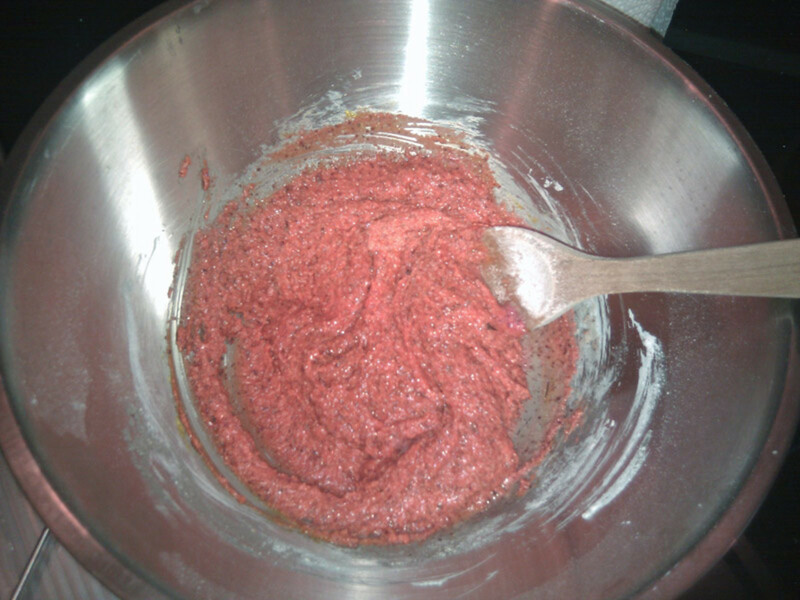 Blend until fully mixed and without any lumps (consider sifting if you can't get all the lumps out). Step Three: Start Cooking Sugar and Water. 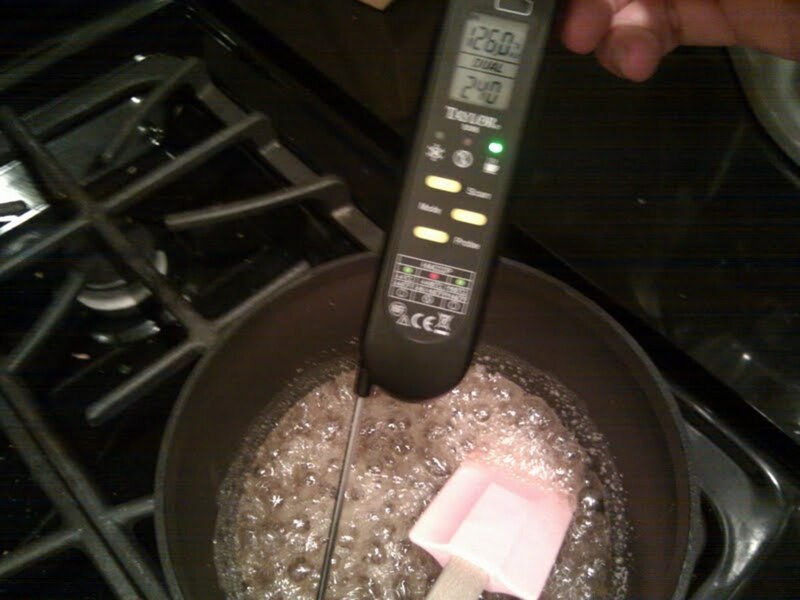 Put the 200g of regular sugar and 50g of water in a small pan and begin heating it. When it dissolves and starts to bubble, start checking the temperature. The goal is to get to 245F (118C). If you don't have a thermometer, cook until it is bubbly and frothy. The "cooked sugar" (sucre cuit) will be bubbly and frothy, but will not caramelize due to the presence of the water. Step Four: Start Whisking Egg Whites. Whisk until you have stiff peaks... but don't over-beat! Step Five: Pour Melted Sugar Into Whipped Egg Whites. Set your mixer to "low," and slowly pour in your melted sugar (at 245F/118C) in a thin stream while the eggs are being whipped. 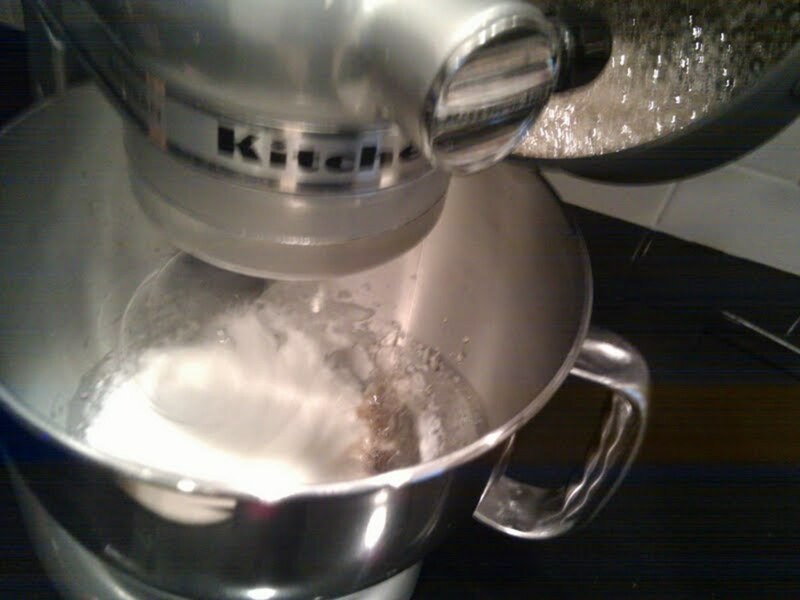 Once all the sugar is in, raise the speed to "high," and let it whip for another 2-3 minutes. 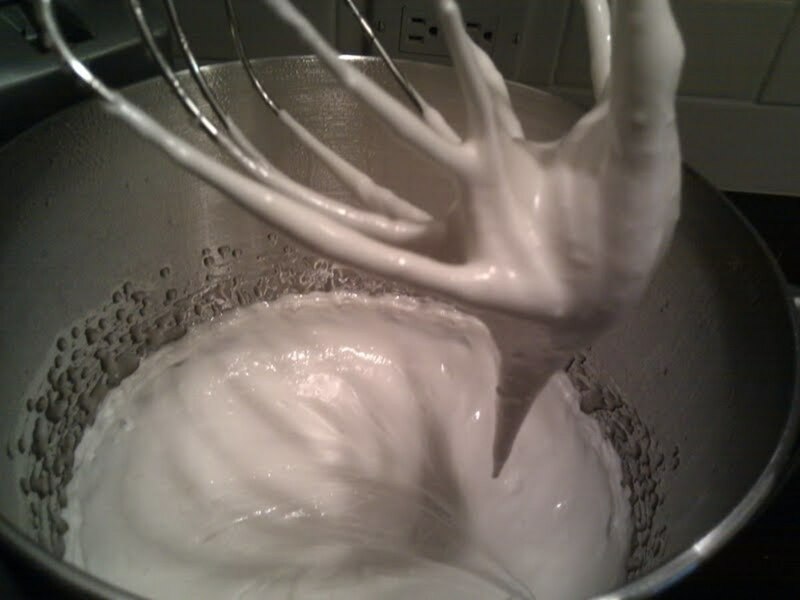 The whipped egg whites will go from a pale, translucent white to a brilliantly shiny, glossy, bright white color and will develop a creamy texture (it will become a meringue). It is very, very much like marshmallow topping, if you're familiar with this ice cream sundae topping. The meringue is done when you pull out the whisk, turn it sideways, and a "bird's beak" of meringue dangles off the tip of the whisk (see picture below). ...and whip until you get a "bird's beak"
Step Six: Mix Egg Whites Into Almond/Sugar Mixture. Mix the other 75g of unbeaten egg whites into your almond meal/powdered sugar mixture. It will result in a fairly stiff batter. This is the time to add any food coloring if you wanted to. Go heavy on the dye, since, after adding the meringue and baking, the macarons will be much lighter in color than the batter now. I added red dye to this batch since I wanted pink macarons. Step Seven: Gently Fold in the Meringue Into the Batter. In a technique the French call macaronnage, gently fold the meringue into the batter. Do not mix aggressively; you do not want to deflate the meringue you've made. What I've found works best is to take a small portion of the meringue and fold that into the batter first. 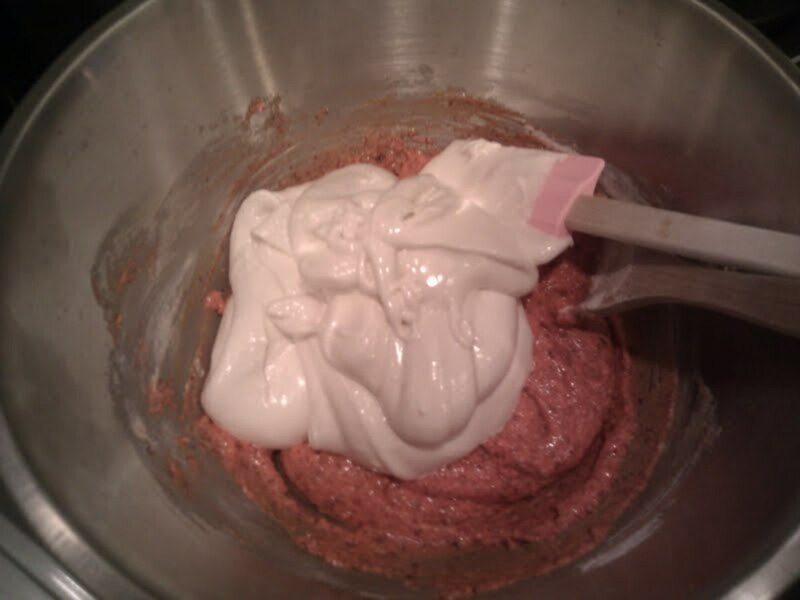 This will help "liquefy" the batter somewhat, making it less stiff and less resistant to folding in with the rest of the meringue. Then, add the rest of your meringue to this softened batter, gently folding it in. I've found that about 20-30 folds incorporates the meringue into the batter. The resulting batter should have the texture of lava—when you pull your spatula/spoon out of the batter, a ribbon of batter drips back into the bowl and slowly reincorporates into the batter. ...and after about 30 folds. Step Eight: Pipe the Batter Onto Your Parchment Paper. Put you batter into either a piping bag or a large, clean plastic bag with the corner cut off. Fill your chosen utensil about halfway full of batter. 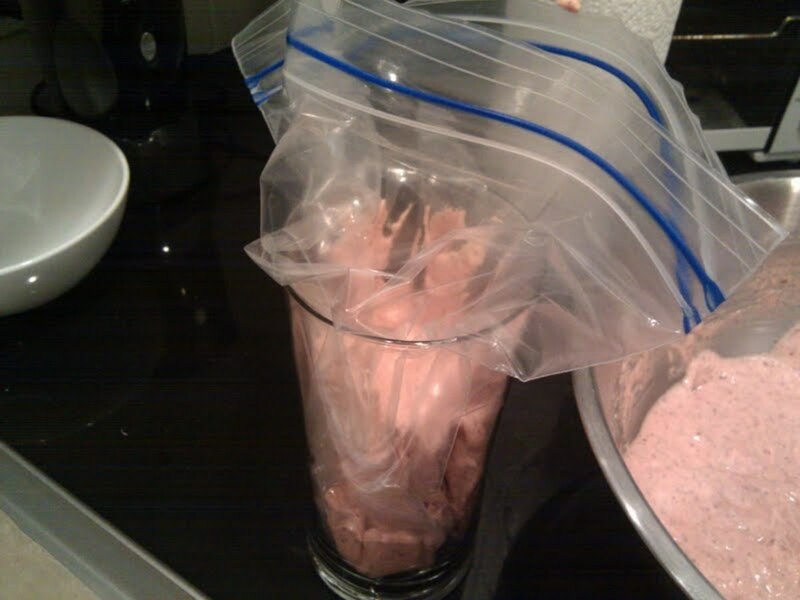 It's a good idea to put your bag into a tall glass, open it up, and fill it with a spoon or spatula. Put parchment paper on your cookie sheet, and pipe small circles of batter (maybe 1 1/2" in/4 cm in diameter), leaving plenty of room between batter drops. 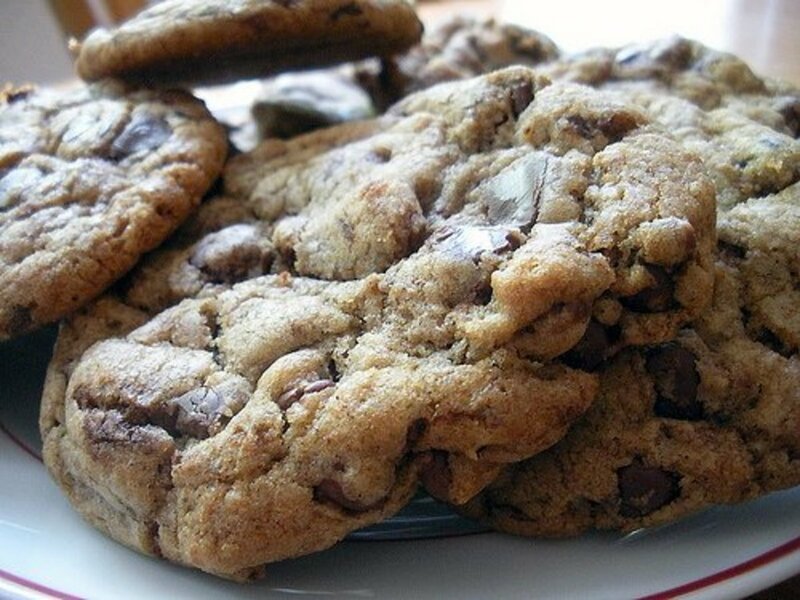 When done with a sheet, pick up the cookie sheet and drop it on your counter carefully but forcefully to help the batter spread a little bit and for any air bubbles to pop. 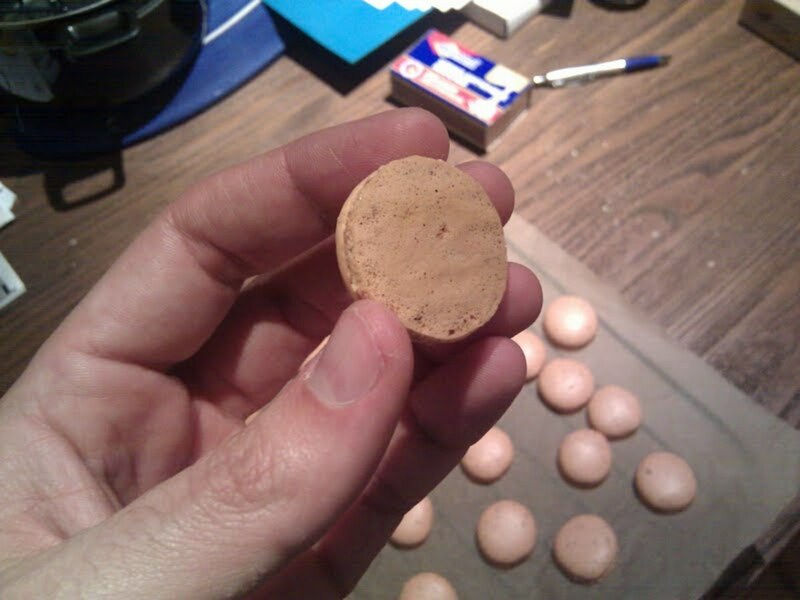 This is an optional step, but if done right, it will lead to better-shaped macaron shells. Most recipes call for the pre-baked, piped macarons to "rest" for at least an hour before going in the oven. With the Italian meringue (au sucre cuit method), this isn't crucial, but it's absolutely fine to pipe, and then wait for a while before baking—it's very stable. Forcefully setting the macarons down will help distribute the batter better so that you are more likely to get nice flat sandwiches pieces. Stand your bag in a tall glass, open it up, and fill it this way. Very easy! Bake for 15 minutes in a 320F (160C) oven. If you have a convection oven, 15 minutes is good. If you don't have a convection oven, rotate your cookie sheet once halfway through to make sure the baking is even. Put an empty baking sheet or two below the cookie sheet you're using in order to deflect any direct heat from the bottom. Too much direct heat from the heat source at the bottom can cause the macarons to build up into mounds that crack (like mini volcanoes) instead of the flat, unbroken tops they should have. Step Ten: Finish Them Off! Pull your macarons out of the oven; you should be able to pull them off your parchment paper without too much effort and with almost no residue. If your macarons are sticking to the paper or leaving behind quite a bit of the dough, then bake them a bit longer—they're underdone. Allow them to cool, and pair similarly-sized shells together. 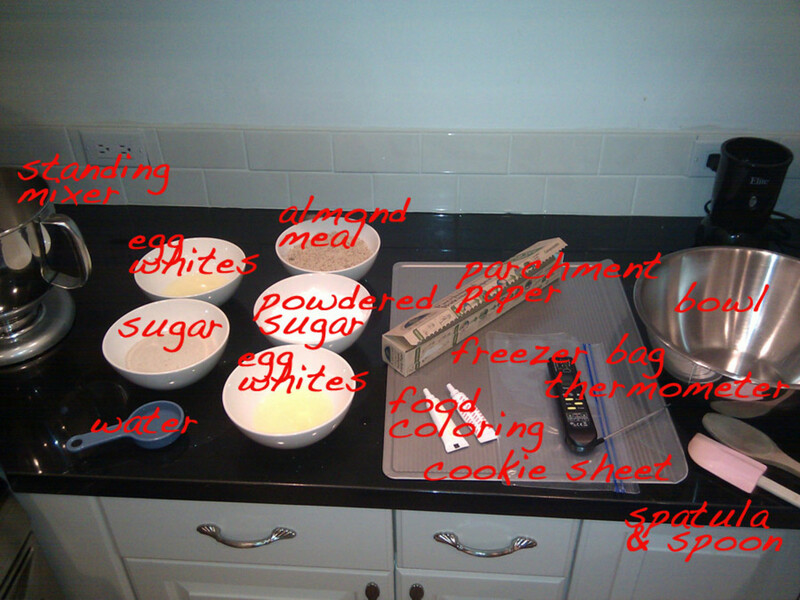 Spread a bit of filling (the recipe for the caramelized white chocolate ganache I used is beneath the picture below). You can put ganache, jam, jelly, buttercream, icing, or anything you like really that will glue together the two halves and provide a complementary flavor to your sweet, almondy shells. Your macarons should be flat on top, with "feet"--the ruffly bottoms you see here. 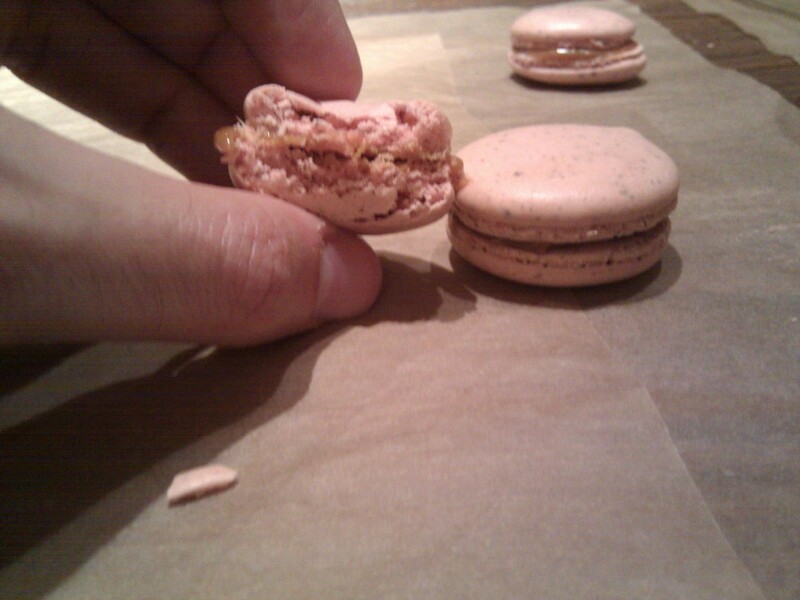 The macarons should slide off the parchment paper easily and yield a flat bottom like you see here. The finished macaron...with bite taken out. high-quality white chocolate (at least 30% cocoa butter); Avoid "white baking chips" or anything that doesn't explicitly say "white chocolate." Preheat your oven to 250F (120C). Chop up your white chocolate, and spread it in a deep baking sheet (not a completely flat sheet, since the chocolate is going to liquefy and run!). Place in the oven. Every 10 minutes, take the sheet out of the oven, and mix with a silicone spatula. The liquid will continue to darken, and eventually take on a light-brown/caramel color. The color may be uneven and the texture similar to goat cheese; that's OK.
After about 5 cycles (about 50 minutes), heat the cream to boiling. Add both it and the melted, caramelized white chocolate to a metal bowl. Whisk aggressively for at least 5 minutes, until you have a creamy ganache. Cool in the refrigerator until it's room temperature (about 10-15 minutes) before attempting to use. I haven't had a macaroon in awhile, with this recipe I couldn't help but make my next dinner party a success! The photos and instructions are well defined. Thanks for sharing. What a beautiful job you've done with the recipe, instructions, photos and layout! This is a great example of how to write a recipe that's easy to follow and likely to help readers produce successful results in their own kitchens. Hmm, that's a good question. Can you put something in front of the fan - like a tall bread pan or something - that diverts the flow of air without completely blocking it? When making them in a convection oven, I had a problem with the fan blowing the tops over. Other than that they were great. What's a good idea to keep the tops blowing over. I rotate, but still have the same problem. I have the fan on low, but the fan cannot be turned completely off. Any suggestions? Hmm...not sure. Do you mean they were bumpy or wavy or something? What was the texture of the bottoms? I just tried out this recipe a few days ago. I've never attempted macarons before because of their reputation for being temperamental, but your recipe made it easy! Everyone was really impressed with them. My only problem was that the bottoms of the macarons did not come out flat. Any idea why that could be? So glad to hear it, Rose! riza0824: No, I didn't have to open the oven to release moisture; the procedure I laid out above is exactly the one I followed to great success. :) Let me know how they turned out for you when you get the chance! This is a cut above the rest of the videos I watched in making macarons. I've been researching for nearly 3 weeks now, because I want to get the right technique. The sugar and water boiling scares me since I made them without the thermometer before, and it continued to cook even if I turned off the stove. So, I have to find a good thermometer. Also, I read that this technique is better because you do not risk on overmixing since the merengue/liquid sugar mixture holds it nicely than the other technique. One recipe I read calls for baking it at 275F for 20 minutes, and the other says leave the oven ajar for 5 minutes at the start to release the moisture. Can you comment on this? I'm saving your recipe and will let you know how it goes. hannahpoo: I'd do it in step 6 above, although be careful about introducing too much liquid or anything that would substantially change the consistency of the batter. I think it's safer to focus on the filling if you want a really powerful flavor. any tips on how to alter the recipe for different flavours? Glad it worked out for you, Larrie! Creating an even "barrier" of cookie sheets between your baking macarons and the heat source might help with those cracked tops. Uneven heat is what does it. I JUST made these, and they came out GREAT! 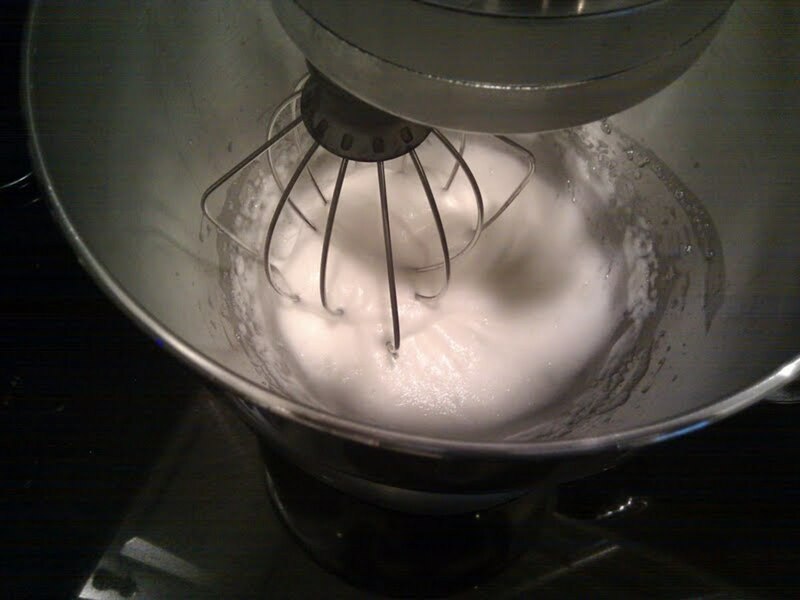 Probably more difficult without a standing mixer (my merengue did not fluff up quite as much as I wanted it to!) however I got some cute little cookies to show for it. About a third of my cookies cracked on top, but I blame my oven, as it is a piece of junk. Thank you so much for this tutorial! vespawoolf: Thank you! Mine never look as nice as the Laduree ones - in fact, I rarely dye mine - but they taste fantastic and I love the texture. Give them a shot; will give you a taste of Paris at home! I'm super impressed by this hub! I had Laduree macaroons in Paris and never forget them. Now I can make them at home. Thanks! This is a very useful recipe! Once, my ship's master requested us in the galley to cook a special macaroons for the visitors. We did a different version but this one is awesome! Where can i buy a parchment paper?? thank you so much for this recipe. fyi, it is NEVER spelled "macaroon" - a macaroon in one thing, a macaron something else entirely. Miss K: Thank you for sharing your experience. I had no idea letting them sit would help for sucre cuit/Italian meringue-method macarons. Helpful tip! I have made these three times and they're been great (almost) every time. I live in Australia and so I think it's a bit more humid here, but I have found that if I let them sit for two (!!) hours before baking, they don't crack, they get feet, and they cook quickly without getting too crunchy. Mmmmmm. The white chocolate ganache is the bomb!! Hi livelonger, I am now about to do a recipe hub and from the Learning Centre, it is recommended that we use the recipe capsule (it was here that I found your hub)Can you share with us, for this hub, do you use the normal text capsule or the recipe capsule. I also observed that you don't have the rating capsule in your hub. Ella - you're absolutely right. Thanks for the correction! Sheri: Yeah, some ovens are finicky. Glad you have somewhat of a solution. Hope you come up with a tweak that gives you reliably round, domed shells, too! The second try was much better! I set the oven to 300 F and I vented the oven toward the end and they did not brown! 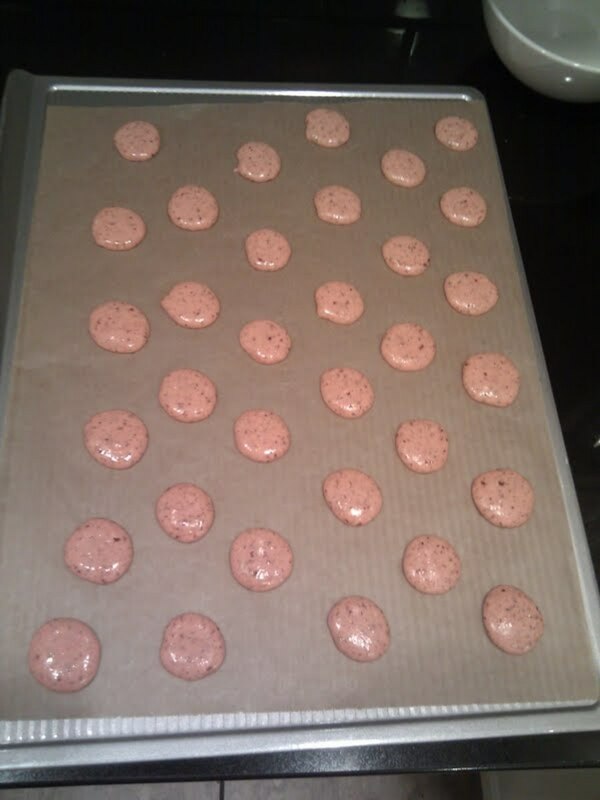 My shapes were a little off - I let some of the trays rest, and those macaroons never flattened. A couple of the trays did not rest and those were closer to the right shape. but ALL taste great - texture is good, etc. Thanks for this great recipe and explanations, and also for your responses to comments! Sheri: I'm surprised you're having difficulty with the recipe, since you're following it to the letter. It might very well be your oven. I use the convection bake setting of my oven, too. Are you sure your broiler isn't on? I've never had the tops of my macarons brown like that. This is my second try - first tasted amazing but they were in no way the right texture. 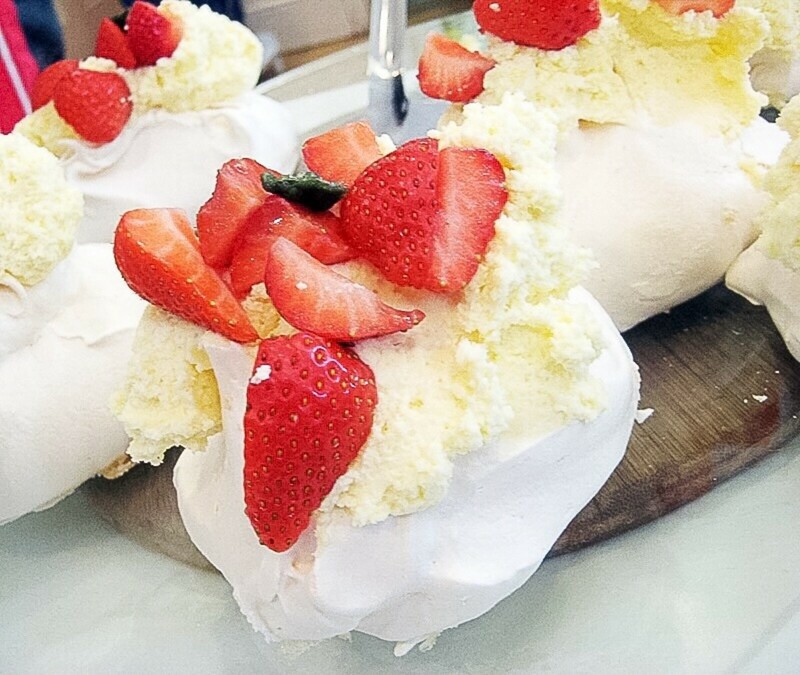 I blame the high humidity that day - my meringue was not right. Also, my oven is convection only and the last time the tops turned brown pretty fast. I tried varying the temperature and time, but for a convection oven is 320 F really the right temperature? Since I am not that experienced a cook or baker, my oven really drives me insane because I have to constantly experiment and this recipe is a little expensive to do that a bunch of times. Kitty: It's an essential ingredient: you can not make macarons without it. Maybe you can try freezing almonds, and then using your blender or food processor to grind it down into a powder. 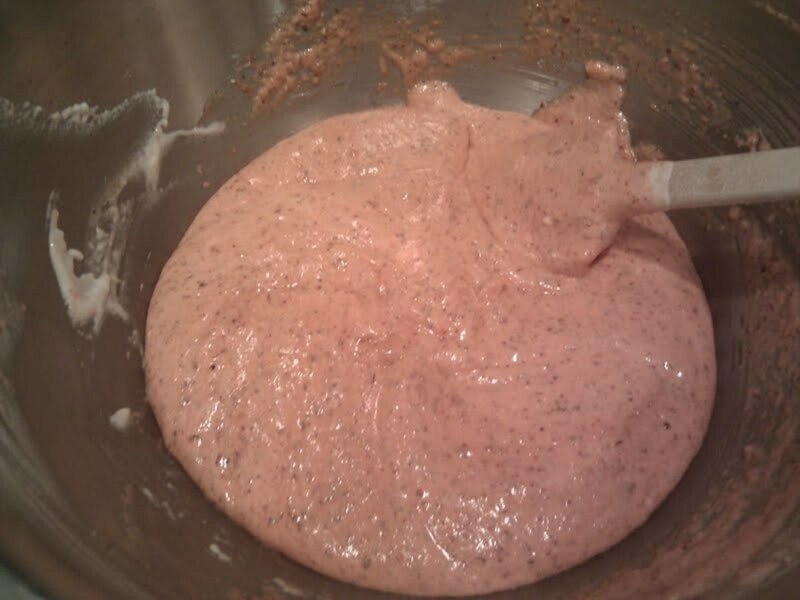 If you blend it too long or at too high a temperature, though, it will turn into almond butter, not almond meal. I like it because it is Glunten-free...thanks Jason. Georgie: You can use either powdered sugar, or caster/regular sugar that you've blended with a powerful enough blender to turn into a powder. The latter will still lack the cornstarch of powdered sugar you buy from the store, but the cornstarch is unnecessary. Good luck! Livelonger, This recipe looks good, but dont think I will be trying it soon. On your last recipe someone asked you to FedEx some croissants, so here I go just ship me a batch of cookies LOL. : ) Voted up! Glad to hear it, Jennifer! This recipe was great!! So happy with the macarons. I made orange buttercream filling and they tasted delicious and look great. Perfect for Christmas Presents! Marg: They will eventually go soft. The moisture from the filling will eventually make the shell soft, especially if kept in a moisture-trapping enclosure (provided you use a moist filling like a jam or ganache). But that does take a while, and as long as your macarons are completely cooled down before putting them in a container, you should be fine. Can the macarons and the fillings be made in advance or do they go soft? danimart: It depends on how big you make your macaron shells. 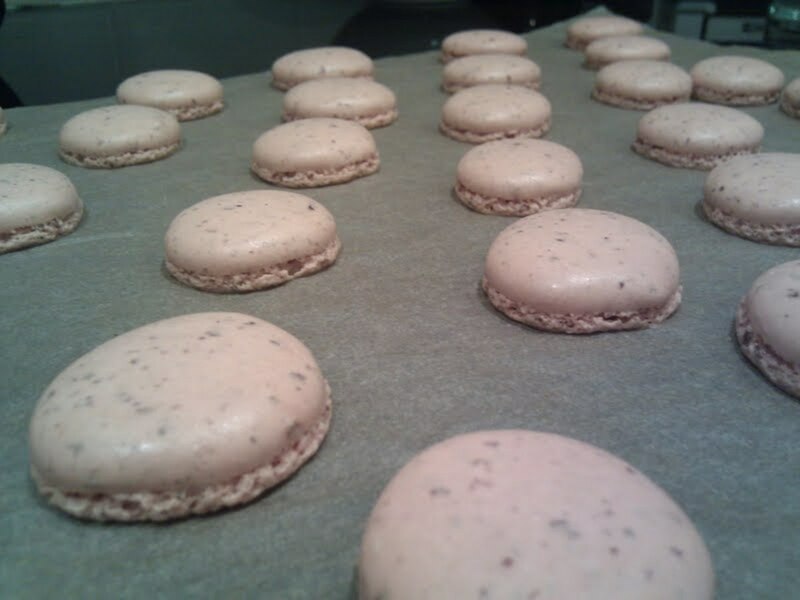 Mine were medium-sized, and I was able to make about 60 shells or 30 macarons with this recipe. So glad to hear that, BundleUp and Mo! Yes, Mo, the recipe is almost foolproof - the only problem I've ever had was uneven heating in the oven, which I solved with a layer of baking sheets in the shelf below. Thanks, danielle, for the links - should be helpful to many macaron attempters! I used this recipe for my first attempt and they turned out perfect! They were delicious and they looked just like the ones I've seen in bakeries. This recipe was amazing! Love this recipe! It will be so easy to follow. I have always wanted to try making french macaroons. I'm going to make them this week with my daughter. It will be fun to try! Thanks for the great photos too. thanks for these instructions and the video. i think i'll need to try it a few more times before i can get them right. Macaroons have always been one of my favorites and it really like the way it was presented. Cheese_stick: Good question. I had my oven on convection, which circulates the heat. Provided you don't put your sheet near the top, I'm going to guess that top & bottom heat might provide the most even heating experience, which is what you're after. Need expert advice. I'm having trouble with my electric oven. I dont know what setting is best, top and bottom heat or just bottom heat? Thanks so much. This is really easy and simple to make. Thank you cheers! I made these with your recipe and they came out perfect! I was so shocked because most of my friends didn't have it come out right the first time, but this recipe did it for me! I have seen these macaroons in some French pastry shops in Winter Park, FL. I can't wait to attempt your recipe. Merci beaucoup! Ouuuuiiiii!!! Instead of buying,I'll make some macaroons! :-) They're so popular among kids and kids at heart. Thanks for this step-by-step guide. I'm actually coordinating a party. Your hub just gave me a good idea about what to serve for desserts. My biggest concern with making macaroons is trying to get a consistent shape and size...do you have any tips for this? I love Macroons! reminds me of a trip to Paris ...I have never tried making macroons before but with your Awsome step by step instructions! I have to try the recipe! Hi Ashleigh - Glad you had success! For the cracks, maybe your oven was running just a touch too hot. I would lower the temperature a bit next time and see if that helps. I made these today and they are absolutely delicious! Most of them had small cracks in the top though, any tips on how to avoid this? Very informative recipe for me ,who does not know how to cook.I have taken good note and will try it soon. Looks for a great recipe, I will definitely try it. Nice work,thanks foe the colorful pics in there. pink: try again! seriously, i am no wiz in the kitchen, but this method works every time. Your macarons look really good!! I tried to make some a few days ago and it was a complete failure...when I put the composition on the baking paper..well...4 macarons became one macaron...one long macaron.I tried to make pink and blue..in the bowl they looked really cute..but after taking them out of the oven ...the blue was green and the pink...was not pink at all..yeah..well i'm gonna try again or maybe I'm not made for this.. Awesome recipe! 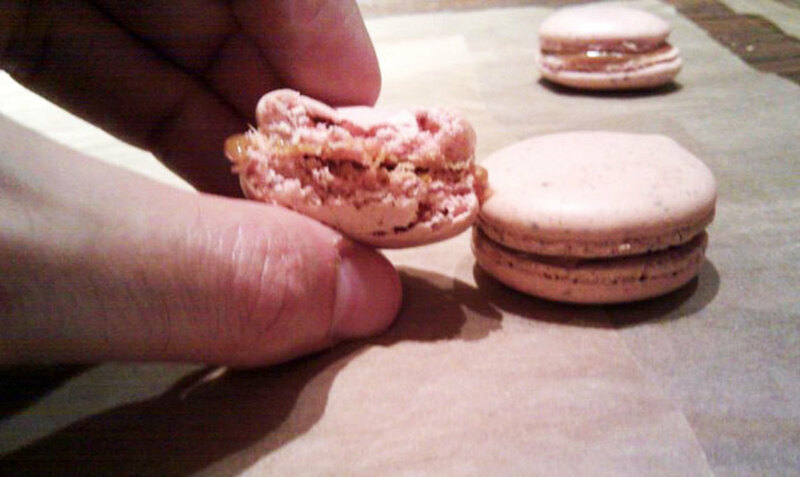 Although I think I overbeat my eggs so the macarons did not puff up as much. I also added some rose water and used strained rose preserve for the filling. Lucky mom! Roda - you can make your homemade ones with either no dye or with natural dyes, which would be even better than those Laduree ones (although they *are* gorgeous). My son went to Paris for holiday last week and brought back some macaron from Laduree. They were exquisite so I shall love to bookmark your site to try your recipe out. Thanks. I love those and I've been hoping to find a recipe ~ so thank you!!! Thank you, all, for the positive feedback! Please let me know how it turns out if you try making them. Super hub - I love macaroons - even the coconut mound ones! These look excellent, and your photos make the techniques super easy to follow! I will have to give this a try. Great Hub! I am very excited because macrons are in vogue in Duabi and Abu Dhabi, where I live. I am going to use this hub to try to really impress my friends! Vote up! These look wonderful. Thanks so much for the recipe. Rated up - and yay! This is, hands down, the coolest recipe Hub I have yet to see on HubPages. Can't wait to try this myself - I already know they taste GREAT!! I had no idea how much effort it took to make these, my sone loves them and I might just try it out. Wow, these look yummy, plus you have put it all together very nicely, I would definitely try these! Thank you! They're fun to make, and yes, quite tasty. Give them a try sometime! Those are great photos . . . so complete! I have not seen this recipe before. 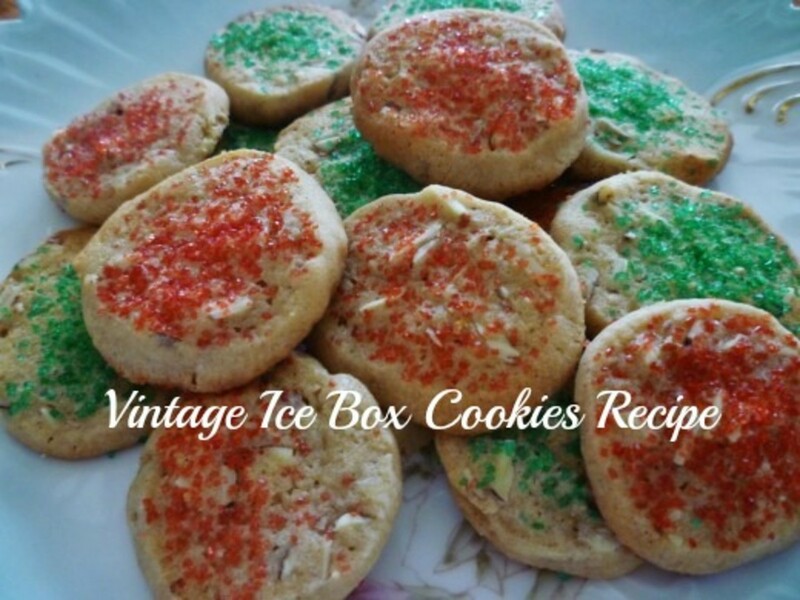 I have tasted these cookies, and they are delectable.